This women’s health test measures five key hormones using a saliva sample: Progesterone, Testosterone, DHEA, Cortisol, and Estradiol. Tested at world-class CLIA-certified labs. Fast, Easy, and Reliable: 1. Order online. 2. Receive the kit. 3. Collect sample at home and ship. 4. Receive a confidential report within days. Free Shipping both ways and physician reviewed report. Questions? Contact Us. Text: 971-205-2185 (9a-6p PST). What is an At Home Female Health Test? The Female Health test measures hormones essential for women’s overall health. A balance of these hormones affects muscle strength, bone density, weight gain, pregnancy in women, and the healthy aging process. Progesterone: The female hormone responsible for preparing female body for pregnancy. Progesterone plays key role in maintaining regular menstrual cycle and high levels can cause PMS, mood swings, and tenderness. Testosterone: This female sexual hormone is also responsible for building muscles and reducing fat in women. Low levels can affect weight gain, muscle and bone loss while high levels can cause infertility. Knowing testosterone levels helps determine how your results look for a normal aging process. Estradiol: The most common form of estrogen, estradiol is a female hormone responsible for menstrual cycle. It affects bone health, especially after menopause. It plays important role for healthy liver, skin, and brain. How to get tested for Female Health? The easiest low-cost way to get tested for women’s health is from the convenience of your home. Simply order a Female Health test kit, collect a saliva sample, send your sample to our CLIA-certified labs, and find out your levels in less than a week. For more information on each of these hormones please see: All About Testosterone, All About Cortisol, the Wikipedia page on Estradiol, and brief description of DHEA from Webmd or Mayo Clinic. This article from Healthywomen.com is an excellent source of information on Progesterone. A: The kit for our at-home Female Health test contains a vial to collect saliva, instructions on how to collect the sample, and a form requesting basic information including date and time of collection. The directions are straight forward and easy to follow. A: The report with your test results will be easy to understand and will have all the necessary details. It will mark your levels for P, T, C, DHEA, E2 on a range expected for healthy levels. The report will also specify what are the expected low and high ranges. It will briefly discuss what your numbers mean and what next steps should be taken to maintain healthy levels. A quick Female Health test ordered from home can help check all your key female hormone levels and assess whether you need to make any life style changes to bring your numbers to normally recommended levels for your age. At-home Female Health test from RxHomeTest.com can help you understand potential risks arising from an imbalance of hormones, especially if you are trying to get pregnant. An at-home Female Health test can help you assess your levels right from the comfort of your home. Better health results in better quality of life, and an at-home health test for women from RxHomeTest.com can offer insight not only into various health symptoms, but it can serve as a motivation to treat each of these symptoms and have a better quality of life! Still wondering where to get a women’s health test? RxHomeTest.com is one of the best places to get women’s hormone levels tested as we process your tests at the same CLIA-Certified labs that other physicians use but no lab or doctor visit is required. So rest assured that your saliva test to check hormone levels is being processed in a world class lab. RxHomeTest.com offers one of the best tests for women’s hormone levels with convenient, confidential, and reliable results at some of the lowest prices in the market. At-home Female Health test is quick and easy, can be ordered online, and doesn’t require a doctor’s visit or prescription. This saves time and money on visits to the doctor and the lab. 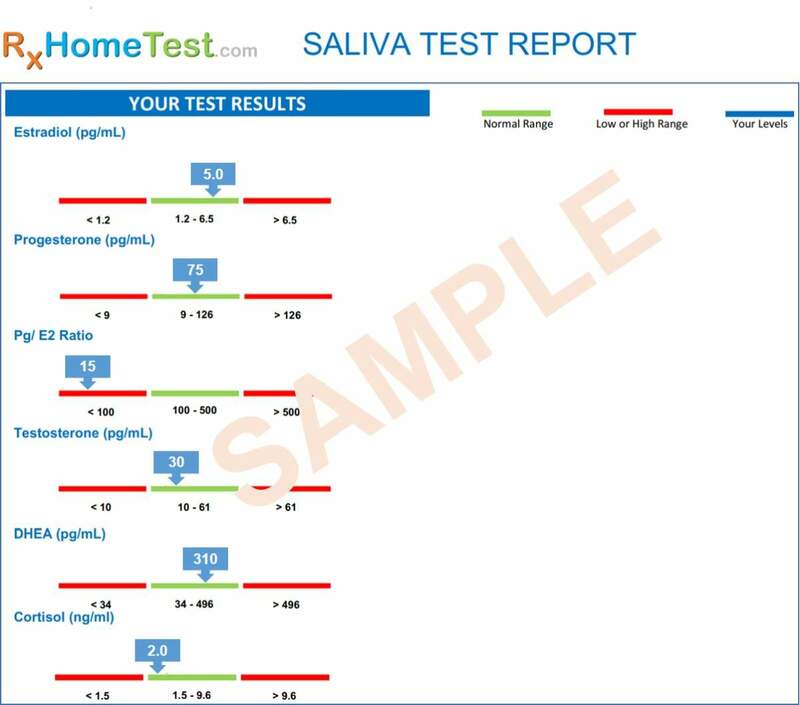 The at-home Female Health test, ordered at RxHomeTest.com, requires just a vial of saliva and is especially useful to those afraid of needles. The test includes a doctor’s prescription and review, two day free return shipping, and you get results within a week.